This is good because what I did accomplish in the last few days was getting a number of items prepped to be finished for the craft fair and other things. I went to work on my tic-tac-toe games and got them one step away from final assembly, all are already coated in lacquer and just need to put the pin in for the lid. You can get an idea of the process form the pics below. The best part of doing them in batch is the single set up. I only had blocks for 6 so that is what I am going with. 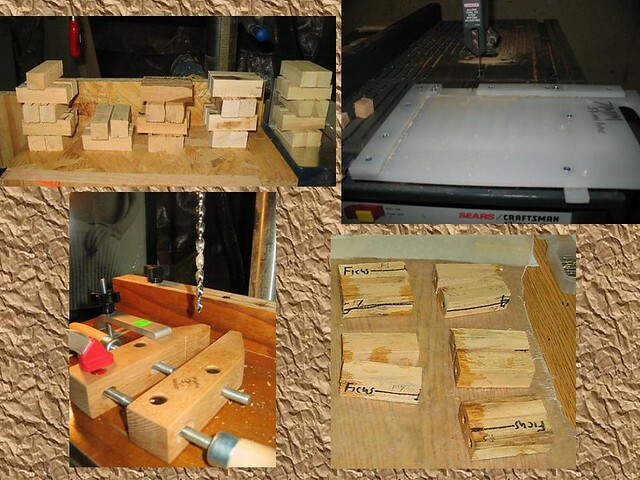 The last pic you see there is a pile of the ox yoke puzzles that I am debating putting a finish on. The wood is meant to be handled and I think not really need a finish. If anything maybe some mineral oil/Beeswax which I have been wanting to try. 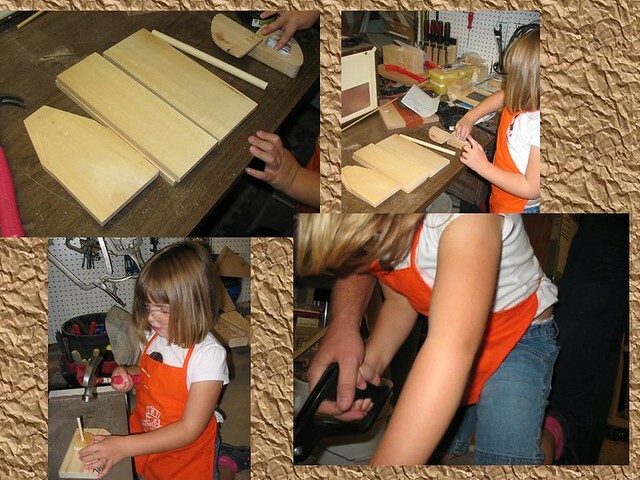 My daughter worked with me one night in the shop and practiced her sawing and nailing. We picked up the toolbox kit at a rummage sale a few weeks ago, have to get her back in the shop to help finish it. 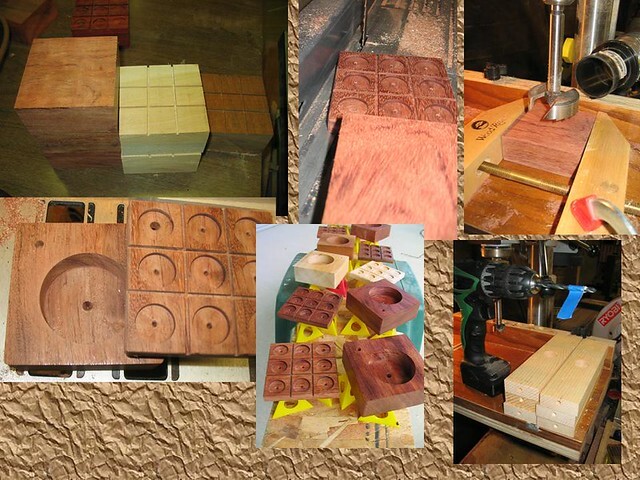 Since I was in the process of batch cutting items I decided to continue with prepping to make a large batch of pens. Once I got it properly aligned; my new slimline cutting jig worked great (Ikea has somethings that are useful, like those cheap cutting boards). The woods I worked on tonight are a bit different then normal; Ficus, Red Tip Photinia, Honeysuckle, Thunder Plum, and Maple. Looking very forward to working with all of these. 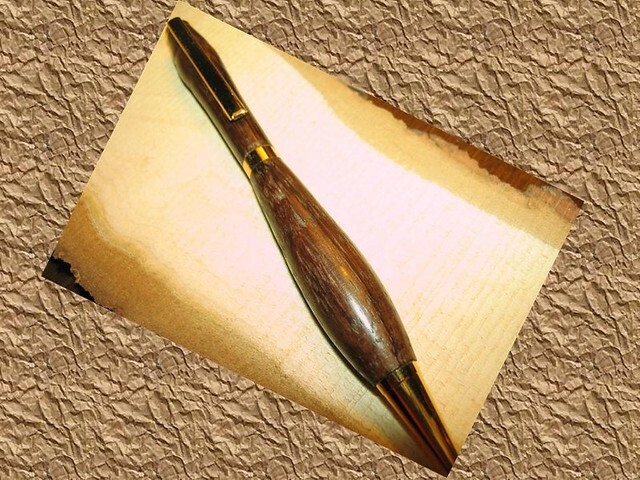 All this pen prep made me hungry to actually make something, So I made a new pen. I actually have no idea what the wood is as I had made the blanks a few weeks ago and they were just sitting by my lathe. The good news is my new live center I bought works great. Much better then the old worn out dead one. Well that is enough rambling on for the evening. Hope you all have a good week in and out of the shop. lookin’ good. When’s the craft fair? Thanks guys. Craft fair is the first week of November, so not a lot of time. I have a few more ideas for some other games and my wife and mother are making stuff to sell at the booth as well, so it will be wood, fabric and yarn. Hopefully all will go well.